In 2019, Oceania Cruises will offer five ships in Europe! Enjoy a wide variety of cruise itineraries to choose from, including Scandinavia & Russia, Northern Europe, Norway, Mediterranean, Black Sea, Trans-Atlantic and Repositioning cruises! Enjoy our newest ships Riviera and Marina with only 1,260 guests or feel like one of the family onboard our smaller ships Insignia, Nautica and newly updated Sirena with only 684 guests. OLIFE CHOICE Europe Cruise Sale with Cruising2Europe.com! When Booking with Cruising2Europe.com You'll Receive Shipboard Spending Money! Jacques Pepin, the noteworthy and celebrated chef, author, and food columnist brings his culinary artistry and legendary cuisine to the ships of the Oceania Cruises fleet. Jacques Pepin oversees all culinary programs including the creation of menu offerings, wine lists, and training of our onboard Executive Chefs. Jacques Pepin is the host of award-winning cooking shows on national public television and the author of nineteen cookbooks. He has also served as the personal chef to three French heads of state including Charles de Gaulle. Travel with the premier tour companies aboard air-conditioned late-model equipment at every port. In addition to our group departures, you may choose from a wide range of customized, private tours with highly personalized service. Europe takes on a whole new look. Think of it as an extreme makeover, as we have literally and figuratively pushed Europe's boundaries so far in every direction that it feels like an entirely new continent, even to the most experienced connoisseurs of Europe. More than three-quarters of this year's itineraries are brand-new; a spectacular enticement made even more extraordinary by the fact that we have sprinkled 30 exotic new ports among them. From the first time ever, our ships now sail to jewels such as Alicante on Spain's radiant Costa Blanca, Croatia's medieval walled city of Korcula, the hallowed Greek isle of Patmos, and Syria's historic Tartus, once a stronghold of the Knights Templar. In France alone, we have added seven new destinations, including petite Sanary-sur-Mer on the French Riviera, and in Turkey four stellar new ports beckon travelers. Farther north, our ships explore with equal passion, sailing far beyond their reach in years past. The possibilities are truly astounding. Indulge in a hearty meal of venison and a local brew in Russia's proud Murmansk, the world's largest city north of the Arctic Circle. Stroll the waterfront in Sweden's historic Gothenburg and sample its renowned shops, restaurants and cafes. Marvel at the stunning Icelandic fjords surrounding remote Isafjordur. Watch massive polar bears lumbering across ancient glaciers on the Norwegian island of Spitsbergen. To complement the dozens of bewitching new destinations, we have preserved our itineraries' icons. Our ships will still overnight in signature ports such as St. Petersburg, Istanbul and Venice, and call on favourites such as Italy's Amalfi coast, the Dalmatian Riviera in Croatia and the emerald-green shores of Ireland. Enjoy a beautiful blend of classic ports of call and fresh new destinations, so wherever you sail in Europe, you will see it from a new perspective. Welcome. It's more than a warm greeting; it's how you feel on our ships from the very moment you step onboard. Perhaps, it's their ideal proportions. After all, being mid-sized affords indulgences you simply won't find on larger vessels. The striking sense of comfort instantly puts you at ease. The elegant, yet casual ambiance creates a convivial mood that invites you to relax and experience the world from a unique vantage point. A generous ratio of staff guests fosters an astonishing high level of personalized service. Pleasures abound, always with you in mind. While some may consider a world-renowned culinary experience an extravagance, we consider it a must. Guided by the prodigious talents of the legendary Jacques Pepin, who serves as our Executive Culinary Director, our gifted chefs consistently present cuisine that is, quite candidly, the finest at sea. Open-seating in our four distinctive restaurants enhances the experience even further by freeing you to dine when, where, and with whom you wish. In fact, freedom of choice imbues every aspect of cruises. Free from the need to wear tuxedos or evening gowns, you can flourish and enjoy life on your terms, exactly as you please. Our collection of diverse itineraries offers an abundance of choices as well, including the ideal blend of marquee ports mixed with boutique destinations inaccessible to larger ships. The moment you step onboard Regatta, Insignia or Nautica, you instantly realize this is no ordinary cruise experience. Life is immeasurably different when it proceeds so smoothly, so naturally. And while you may or may not expect such exquisite luxury to be affordable, it is remarkably within your means. Everything you have envisioned in a cruise is here, as Oceania Cruises presents your world. Your way. While the atmosphere onboard our mid-sized ships is certainly elegant, it's never pretentiously so. The ambiance is refreshingly casual and friendly, much like that of a private country club. Intimacy, warmth and comfort are the hallmarks, encouraging you to be yourself, while enjoying the company of other guests who share your enthusiasm for adventure and fine living. Meet over cocktails in Martinis and recount your adventures ashore. Strike up a conversation poolside. Making friends is effortless, as is finding more private areas to relax, when you're feeling less gregarious. In this inviting atmosphere, where every wish is attended to with exemplary service, it's easy to feel at home. We have designed our accommodations to be sumptuous retreats, where you will feel immensely comfortable. Handsomely appointed with soothing colors, soft textures, plush furnishings, and custom-milled French and Italian toiletries, each stateroom and suite is luxury personified. Consider it your own private world, an oasis where you can comfortably relax and recharge. During the day with the curtains opened, natural light streams in, lending the interior a light, airy feeling. Relax in the sitting area while watching live news programs or first-run movies on your flat-panel LCD television, or enjoy a DVD selected from the hundreds of titles in our library. Entertain newly-made friends with champagne before dinner. Watch a sunset on your furnished veranda, a luxury in all suites and 70% of our staterooms. When it's time to retire, slip into the trademark Tranquility Bed, which is outfitted with lavish linens atop a sumptuous pillow-top mattress to ensure a deep, restful sleep. It is quite evident that our international staff has an innate enthusiasm for being of service. Their devotion is absolutely irrepressible. You can see it in their genuine smiles and hear it in the sincere tone of their voices, as they happily and precisely attend to your every imaginable need throughout your voyage. Remembering details, such as adding a lemon twist to your favourite cocktail, or your propensity for a chilled hand towel while lying poolside, only hint at their deep commitment to your name, preferences and wishes, all in the interest of ensuring that each moment onboard will by memorable. The ease with which they anticipate your needs borders on magical. This rare talent is especially evident among the private butlers who meticulously care for guests in our Owner's, Vista and Penthouse Suites. Warm hospitality and impassioned service are the distinguishing traits of our entire staff. Being mid-sized allows for a certain warmth, intimacy and elegance that cannot be replicated on larger ships. The differences are pronounced, especially with regard to the defining points of ambiance, attitude and service. Returning guests are greeted as cherished friends. First-time guests soon develop their own rapport with the staff, and the relationship only deepens with time. It's a matter of great pride that guests and staff consider each other friends by voyage's end. With a maximum of only 684 guests onboard each voyage, our international staff of 400 can single-mindedly devote themselves to your pleasure, fulfilling every request with gusto. Do you want to sleep in, undisturbed, during days at sea? Would you like your martinis extra-dry, with vodka rather than gin? Make your inclinations known, and they will be instantly and forever committed to memory. That warm, caring attitude pervades the ship, promoting an extraordinarily comfortable atmosphere. Guests instinctively introduce themselves to each other, easily finding common ground. While intimate in nature, public areas are alive with laughter and engaging conversation. It is easy to be swept up in the feeling, uplifted by the knowledge that tomorrow holds the same promise. Creating The Finest Cuisine At Sea Requires The Grandest Of Inspiration! While every aspect of the Oceania Cruises experience is a study in gracious understatement, our passion for serving the finest cuisine at sea is anything but. With Master Chef Jacques Pepin, our Executive Culinary Director, devoting his genius for inspiration and culinary wizardry, our cuisine earns rave reviews. All the ingredients for magnificence are present and our chefs carefully and thoughtfully prepare each dish a la minute, just as you would expect in the finest of restaurants. Menus artfully reflect the regions where our ships sail, enhancing the experience, adding authenticity and ensuring tremendous variety. Diversity is our watchword, especially in our four distinctly different gourmet restaurants; all at no additional charge. Each restaurant's liberating, open-seating policy awards you with the freedom to dine whenever, wherever and with whomever you wish. 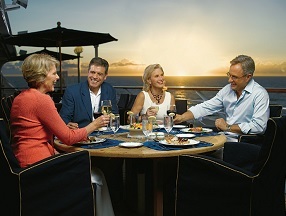 Perhaps you would like to dine early with fellow guests that you met onboard. Or you may prefer a quiet table for two, allowing you time to linger long into the evening. The choice remains completely yours. Simply request a table when it pleases you, and the maitre d' will see to your wishes. Service is equally obliging, the happy consequence of there being a limited number of guests onboard. It's as if someone is always standing by solely for you, anticipating your requests and catering to your every whim.